EastWest Bank Holiday Treats ~ Philippine Freebies, Promos, Contests and MORE! 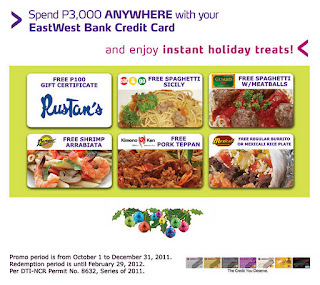 Enjoy the upcoming holiday season with EastWest bank's Instant Holiday Treats. Make a single-spend or accumulated-spend transaction amounting to P3,000 using your credit card and get Rustan's GC plus FREE food items like Shrimp Arrabiata from Burgoo, Spaghetti Sicily from Eat and Go, Spaghetti w/ Meatballs from Gumbo, Pork Teppan from Kimono Ken, and choices of Regular Burrito or Mexicali Rice Pizza from Mexicali. Another great way to enjoy shopping and spending! Only one (1) redemption will be allowed for each qualified P3,000 minimum spend requirement.